Shows that mix comedy with a little bit of horror are definitely among our favorites! 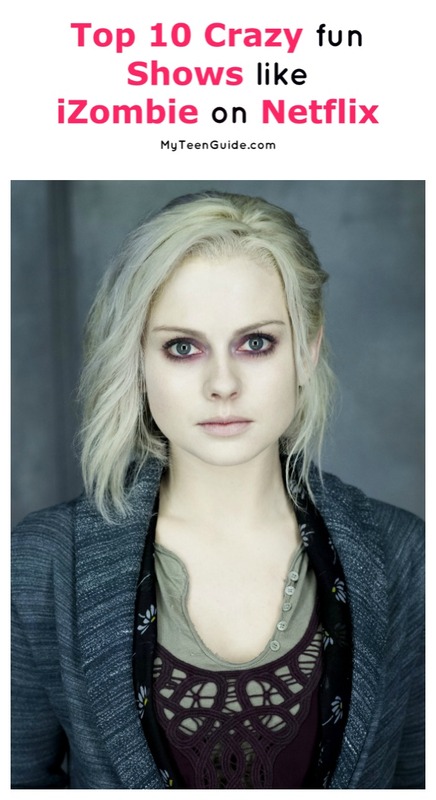 If you love them too, check out these top 10 shows like iZombie on Netflix! iZombie is a television series that features comedy, crime, drama and horror and airs on The CW. It is loosely based on the comic book series, of the same name, from DC Comics. iZombie premiered on March 17, 2015. The season 3 finale aired on June 27, 2017 and has been renewed for season 4. Here are some of the best TV shows like iZombie on Netflix, which has season 1-3 of the series. Bates Motel is a psychological, horror, drama television series that aired for 5 seasons on A&E, from March 18, 2013 to April 24, 2017. It is the prequel to the 1960 movie- Psycho and showcases the lives of Norman Bates and his mother, Norma Bates. Bates Motel stars Freddie Highmore and Vera Farmiga. Bones is a crime drama television series that aired for 12 seasons on FOX, from September 13, 2005 to March 28, 2017. The series showcases the personal and professional lives of Dr. Temperance “Bones” Brennan, a forensic anthropologist and Seeley Booth, an FBI Special Agent. Bones stars Emily Deschanel and David Boreanaz. Dexter is a television series that features crime, drama and mystery. It aired for 8 seasons on Showtime, from October 1, 2006 to September 22, 2013. The series showcases the life of Dexter Morgan, a forensic technician by day and vigilante serial killer by night. Dexter stars Michael C. Hall. From Dusk till Dawn: The Series is a horror television series that is based on the 1996 movie- From Dusk till Dawn. It has aired on Netflix for 3 seasons so far, premiering on March 11, 2014. The series showcases the lives of brothers Seth and Richie Gecko. The series stars D.J. Cotrona and Zane Holtz. Gotham is a crime drama television series that is based on the Batman characters from DC Comics. It has aired for 3 seasons so far on FOX, premiering on September 22, 2014, with season 4 to premiere on September 28, 2017. Gotham stars Ben Mckenzie, Donal Logue, David Mazouz, Robin Lord Taylor and Sean Pertwee. Penny Dreadful is a television series that features drama, fantasy and horror. It aired for 3 seasons on Showtime, from May 11, 2014 to June 19, 2016. The series showcases characters from 19th century British and Irish fiction like Count Dracula, Dorian Gray and Victor Frankenstein. Penny Dreadful stars Timothy Dalton, Rory Kinnear and Josh Hartnett. Santa Clarita Diet is a horror comedy television series that has aired for 1 season on Netflix, premiering on February 3, 2017. The series centers on Joel and Sheila Hammond, a married couple who are real estate agents, who lives turn upside-down after Sheila turns into a zombie. Santa Clarita Diet stars Timothy Olyphant and Drew Barrymore. The Walking Dead is a post-apocalyptic horror television series that has aired for 7 seasons on AMC, premiering on October 31, 2010, with season 8 to premiere on October 22, 2017. The series showcases the survivors of a zombie apocalypse. The Walking Dead stars Andrew Lincoln, Chandler Riggs, Norman Reedus, Lauren Cohan and Danai Gurira. Z Nation is a television series that combines action, comedy, drama and horror. It has aired on SYFY for 3 seasons, premiering on September 12, 2014. The series showcases the journey of Alvin Murphy, who is the only survivor of a zombie apocalypse, as he is taken to a California research laboratory. Z Nation stars Keith Allan, DJ Qualls, Kellita Smith and Michael Welch. Do you watch any other cool shows like iZombie on Netflix? Share below!